The Wind Dancer Tea contains 29 herbs that have been used traditionally to increase energy, strength, and stamina. 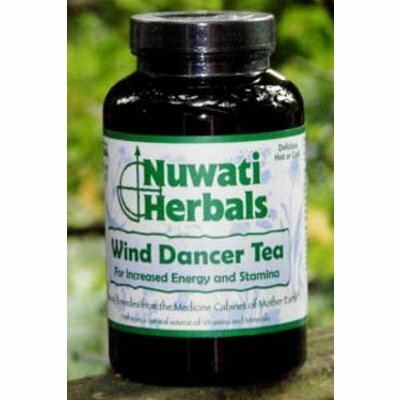 The Wind Dancer Tea contains 29 herbs that have been used traditionally to increase energy, strength, and stamina. The Four Winds display their powerful energy as they dance through the trees and across the land and water. 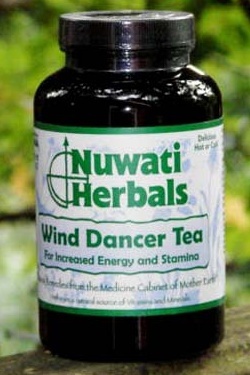 Start your day off with The Wind Dancer Tea or enjoy a cup anytime you need an energy boost. Ingredients: Green Tea, Eleuthero, Galangal Root, Ginseng Leaf, Gotu Kola, Lemon Balm, Tribulus Fruit, Yerba Mate, Atractylodes, Bee Pollen, Codonopsis, Damiana, Ginseng (Panax), Guarana, Licorice Root, Maca Maca, Rhodiola, Schizandra Berries, Spearmint, Watercress, Ashwagandha, Astragalus, Cat's Claw, Ginger, Jiaogulan, Jujube, Peppermint, Stevia, Suma Root. Caution: Approximately 28% of the contents of this jar contain caffeine. If you are watching your caffeine intake, or if you have high blood pressure, consult your physician before using. 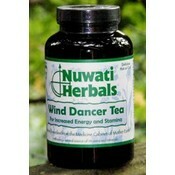 Note: All Nuwati Herbals Teas can be effective hot, cold, room temperature, sweetened or unsweetened. It is just important to get the herbs into your body. Caution: Approximately 30% of the contents of this jar contain caffeine. If you are watching your caffeine intake, or if you have high blood pressure, consult your physician before using. Consult your health care professional prior to use if you are pregnant, nursing, take any medication or have a medical condition.